The temperament of the Belgian Sheepdog is a direct reflection of its abilities. It is a very watchful and active dog, which was great for the duties it was used to perform; it guarded farms and herded animals. It is extremely alert and protective is necessary. /as a family pet, however, it can be extremely playful and loving. As long as it is getting attention and is given some type of active activity, it will be satisfied. When dealing with strangers, the Belgian Sheepdog tends to be a bit aloof and not phased. However, when dealing with other dogs and other animals, it can tend to be fairly aggressive and should be watched if it will be in the company of other animals. This breed is extremely smart but also has a yearn to be independent. It is trainable and once it is trained well, it listens to its owner. It actually becomes very protective of its owner and the family that it stays with. The upkeep of a Belgian Sheepdog may take some effort, as it is a very active dog. It needs a hefty amount of exercise on a daily basis. This could be anything from a lengthy walk through your town, a hike through the woods, or for a nice long jog or run. The breed certainly needs room to run and space to live. This means that it is not recommended for apartment living. It can survive in the outdoors and colder climates, mainly due to its thick coat, but it really thrives when it lives indoors and is surrounded by people. The coat of this breed needs brushed at least 3 times weekly. When it is shedding, it needs to be brushed almost on a daily basis to remove the excess hair so that it does not matte up and cause the pooch any pain or discomfort. Health concerns of the Belgian Sheepdog typically include more minor concerns. There really are any major concerns for this breed to be worried about. Minor concerns include seizures, skin disorders, allergies, and hypothyroidism. Chronic Hip Dysplasia, PRA, pannus, elbow Dysplasia, and hemangiosarcoma are also occasionally scene and should be monitored for any of these disorders. If you Belgian Sheepdog remains healthy, it can live to be approximately 10-12 years of age. 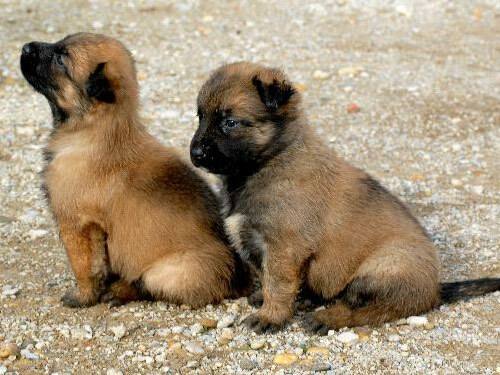 The Belgian Sheepdog, along with breeds as the Belgian Tervuren and the Belgian Malinois are all part of one breed known as the Belgian Shepherd. This is also known as the Continental Shepherd. The Belgian Sheepdog was a farm dog and held the duties of herding and guarding the animals. It, unlike the other two breeds mentioned, had a long black fur coat. These dogs came to be used as police dogs in the late 1800s and early 1900s. During World War I they even acted as messengers, sentry dogs, and even draft dogs. This helped out their popularity as they began to be noticed more often and soon became a household pet. Due to its charisma, looks, and abilities, it has won the affection of homes everywhere.